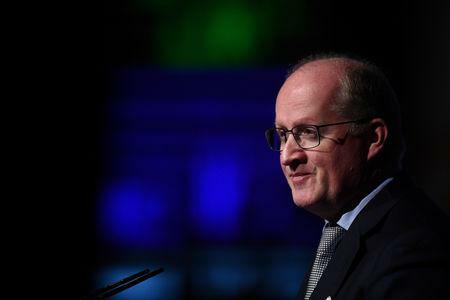 DUBLIN (Reuters) - Ireland began the search for a new central bank governor after Philip Lane was appointed on Friday to the European Central Bank's executive board by European Union leaders. The confirmation of Lane as the ECB's new chief economist, widely expected, will cut short his seven-year term at home at the halfway point. He is due to take up his position in Frankfurt on June 1. His successor will also sit on the ECB's Governing Council, the first time Ireland will have two rate setters. Candidates have until April 5 to apply, the finance department said in a statement. Lane was chosen from a list of 100 potential candidates when the department hired executive recruiters to carry out a similar national and international search in 2015. The successful candidate is picked by the government. One of Lane's two deputies at the bank, Sharon Donnery, is well positioned having narrowly lost out in the race to head the ECB's supervisory arm last year, winning plaudits from Finance Minister Paschal Donohoe in the process. Robert Watt, who heads Ireland's department of public expenditure and has worked closely with Donohoe, was the bookmakers' favourite for the role last time before Lane emerged from a shortlist of four. Andrew McDowell, a vice-president at the European Investment Bank and chief economic advisor to the Irish prime minister until 2016, has also been mentioned in senior political circles as a possible replacement, the Times Ireland newspaper reported last month. McDowell, Watt and Donnery - through a spokeswoman for the central bank - declined to comment. Lane took charge when an economic recovery was firmly in train after an international bailout a decade ago. His successor will take on an economy either on the verge of overheating or facing another major economic challenge, if neighbouring Britain leaves the European Union without a deal to smooth the transition. "Philip is an outstanding economist, and has made an important contribution over the last four years as Governor of the Central Bank," Donohoe said in a statement, expressing his delight at Lane's appointment to such "a prestigious position".